University of Notre Dame researchers have successfully created three-dimensional anatomical models from CT scans using 3-D printing technology, a process that holds promise for medical professionals and their patients. 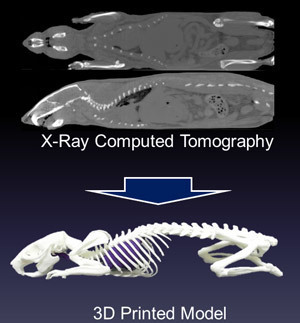 A paper by the researchers, “3D Printing of Preclinical X-ray Computed Tomographic Data Sets,” was published in the Journal of Visualized Experiments this week. The paper reports results based on using X-ray CT data sets from a living Lobund-Wistar rat from the Freimann Life Science Center and from the preserved skull of a New Zealand white rabbit in the laboratory of Matthew Ravosa. Co-authors of the article with Doney, Leevy and Ravosa are Lauren Krumdick, Justin Diener, Connor Wathen, Sarah Chapman, Jeremiah Scott and Tony Van Avermaete, all of Notre Dame, and Brian Stamile of MakerBot Industries LLC, a 3-D printing company. A clinical collaborator, Dr. Douglas Liepert from Allied Physicians of Michiana, is enabling the researchers to print nonidentifiable human data, expanding the possibilities. “Not only can we print bone structure, but we’re starting to collect patient data and print out the anatomical structure of patients with different disease states to aid doctors in surgical preparation,” Leevy said. Originally published by Marissa Gebhard and Gene Stowe at news.nd.edu on April 02, 2013.